Faster than a Speeding Bullet - Go Navy Go! Not superman, but the world’s first active-laser weapon. Fifty thousand times faster than a speeding missile, the laser is unaffected by target speed, atmospheric conditions or distance. Point and shoot, and this weapon sends a stream of protons at the speed of light to silently destroy the target with minimal collateral damage. To illustrate, in one test the laser disabled a small boat by targeting only its engine. We talked about this weapon when it was under development in a 2014 blog. 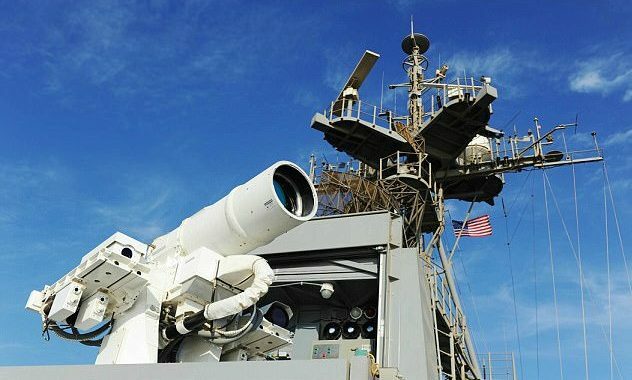 The Laser Weapons System (LaWS) now is deployed on the USS Ponce in the Persian Gulf. Run by a three-person crew, it requires only electricity, no munitions, so it can be fired for only – wait for it — a dollar a shot. During a recent live-fire exercise, a drone (Iran, North Korea, China and Russia all use these) and a small-craft target (popular with Iran) were successfully engaged. Check it out on this video. While the current weaponry targets aircraft and small boats, the next generation under development is being designed to target missiles.